It’s Wednesday, time for the Small Steps Amazing Achievements linky. Thank you to everyone that linked up last week, there were some lovely posts. 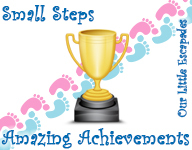 This week Jeannette at Autism Mumma is hosting Small Steps Amazing Achievements. Jeannette’s linky is HERE or you can link up below as the code synchronizes. If this is your first time here you can find out about the Small Steps Amazing Achievements linky HERE, we do hope you join in. Posts can be old or new and don’t forget to share the linky love and comment on posts that spark your interest. We do take the time to read and comment on all of your posts. We also share them on twitter using the hashtag #SSAmazingAchievements. So grab the badge and come and join in. My Small Steps Amazing Achievements Highlights from last week. We also had some lovely update posts from @mamamakedopush, @BecomingaSAHM and @Lianne84 it’s great to see how everyone is getting on. We really wish we could share all of the posts with you as we enjoy reading them all and find it so hard to choose which ones to include in this post, but you can read them all HERE. I can’t wait to see what your children have achieved this week.